THE National Bureau of Investigation (NBI) yesterday pressed charges of large-scale swindling and syndicated estafa against a young woman accused of ripping off over a hundred people through an online Ponzi scheme that promised to increase investments by at least 70 percent in less than two weeks. Bernales said Sestoso was accompanied by her parents as she submitted herself to authorities on Friday. The NBI said Sestoso did not operate the online Ponzi scheme alone. There are others who are still being identified by investigators. The scheme used a form of fraudulent investment model that promised high rates of returns for older investors using money infused by new investors. The said Sestoso did not sell anything but succeeded in luring investors by promising them interests ranging from 70 percent in 10 days to as much as 600 percent. NBI agent Alex Caburnay said investigators tracked down Sestoso through a post on a buy-and-sell group page on Facebook. 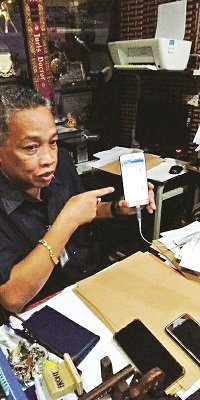 “Wala kini siya’y produkto gibaligya,” Caburnay said. He said Sestoso’s group is neither registered with the Securities and Exchange Commission (SEC) nor with the Bureau of Internal Revenue (BIR). “Dealing with securities and investments is regulated by the government,” he said. Sestoso was brought to the City Prosecutor’s Office for inquest proceedings before noon where she was charged with large-scale swindling and syndicated estafa in relation to the Anti-Cyber Crime Act of 2012. The NBI said Sestoso used the social media network Facebook as platform to lure investors to the Ponzi scheme. Bernales said the NBI would be asking prosecutors not to recommend any bailbond for Sestoso. Yesterday, about a hundred people flocked to the NBI regional office, all complaining that they were scammed by Sestoso. Bernales said there were just too many complainants that investigators had to attend to their complaints by batches. “So far, mga 100 na kapin ug murag mudaghan pa ni,” he said. Bernales said the biggest investment by a single investor recorded by the NBI was P500 thousand. “You can just imagine nga sa kadaghan nga nag-file og complaints, the amount can easily reach millions of pesos,” Bernales said. Caburnay said Sestoso surrendered to the NBI with her parents after complainants surrounded their Kauswagan house. “Gi-subpoena ko na siya (Sestoso) una kay delikado na iyang kinabuhi. Busa adtong Friday mi-surrender na gyud siya. Daghan gud nasuko sa iya,” Caburnay said. Caburnay said it has reached a point that Sestoso could no longer give the investors their money and the promised returns. Meanwhile, Bernales called on the public to be careful when it comes to online investment schemes. “If it’s too good to be true, dapat angay ka nang magduha-duha. Kung ang offer kay dako kaayo, lisod kana matinuod,” he said.